The Hideaway01263 715779work01603 870304fax Self-cateringThe Hideaway is an annexe to the owners' home, and has been loving decorated and well equipped. It is set in mature and well tended gardens in a small village location. There is plenty to explore in the locality including the beautiful beaches on Norfolk's east coast, the market town of North Walsham and the Norfolk Broads. The Hideaway is an annexe to the owners' home, and has been loving decorated and well equipped. 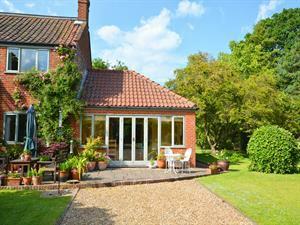 It is set in mature and well tended gardens in a small village location. There is plenty to explore in the locality including the beautiful beaches on Norfolk's east coast, the market town of North Walsham and the Norfolk Broads.